Feedlot for livestock such as goats, sheep or cattle is now widely done by many people. This is likely due to the livestock feedlot (goats, sheep or cattle) can be done with a relatively short time. Because the time is shorter, the capital turns a little faster. But this option is not the fastest. When compared with breeding and enlargement, fattening is the right choice if you want capital to spin faster. Feedloting is usually done for 2 – 3 months only. With a new cage adaptation time and feed may be up to 4 months. Unlike breeding. To produce goats or sheep at reasonable prices, it takes at least 1 year. The result will be more, but should be a little more patient. Many methods that offer feedloting livestock (goats, sheep or cattle) can be done quickly and cheaply. Actually, many factorsthat affect the rapid or slow growth of livestock weight. Among them are the quality of feed, parasitic factors in livestock, the level of stress on cattle, genetic factors in livestock and probably many others. If there is an additional, can share in the comments later …. Provision of quality feed to support the growth of livestock weight is very reasonable. Quality feed here I mean is not only the amount sufficient, but the nutritional content is also adequate. High nutritious feed if only given in small amounts, the result would be less good. Moreover, if feed with poor nutrition and the provision is less too. Parasites here I mean various diseases that may be experienced by livestock. Can disease due to bacteria, fungi, fleas, viruses and others (sorry if my term is less fit). 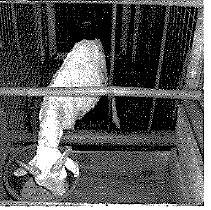 For example a goat that worms growth performance of its weight will be disappointing. The solution, be patient so as not to be disappointed and the goat is treated so as not to wormy. I think if I make livestock (goats, sheep or cows) as comfortable as possible. In 2008 there was research that has been done by the state university students in Bogor. His research on local sheep fattened for two months. The aim of the research is to know the performance of local male sheep with feeding and concentrate for two months of fattening. 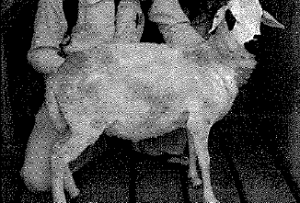 Sheep used in this study as many as 12 tails with age under 1 year. The average weight is about 15.87 Kg. The age of sheep is chosen under one year because in theory, at that age the rate of sheep growth is still ongoing. Of the twelve sheep locally obtained, the weight of each is different. Average weight obtained from the total weight of all sheep divided by 12. The feed used in this study is complete and forage rations. The forage is Brachiaria humidicola grass. Complete ration which used is commercial feed of dairy cow (KPS Bogor). The ingredients used in the preparation of the complete ration are rice bran, pollard, rean meal, copra meal, molasses, cassava dregs, reed peanuts, chocolate bark, vitamin mix, lime, salt and urea. The nutritional composition of the forages and complete rations can be seen in the table below. The sheep house used are individual house with length of 105 cm, width 60 cm and height 110 cm. The house is equipped with a feeding and drinking place too. The tools used in the research include feeding place for complete ration and drinking water from plastic bucket. Thermometer to measure the temperature of the room. The treatment is providing the sheeps with complete ration and Brachiaria humidicola grass. Each treatment consisted of three replications. P1 = 80% Brachiaria humidicola grass and 20% complete ration for 2 months. P2 – 20% Brachiaria humidicola grass and 80% complete ration for 2 months. 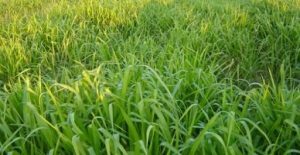 P3 = 20% Brachiaria humidicola grass and 80% complete ration in the first month 80% of grass and 20% complete ration in second month. What is interesting from the results of this study for me is the daily weight gain of sheep. In the first treatment (P1) , the sheep were fed 80% of grass and 20% complete ration for two months, the daily weight gain of sheep is about 45 grams/ day/head. For the second (P2), the sheep were fed 20% grass and 80% complete ration for two months, the daily weight gain of sheep is about 65.56 grams/ day/head. While the third treatment, the daily weight gain of sheep is about 34.46 grams / day / head. Hopefully this post can be information and views. Actually there is much information that can be extracted from the research. Yunita. 2008. Performance of Local Male Sheep with Different Treatments During Two Months Fattening Period. Program Study of Labor Production Technology Faculty of Husbandry Bogor Agricultural University.